The smallest zones in the industry (1 to 3 loudspeakers) maximize local control across your entire workplace. We can adjust the masking sound exactly where needed to achieve the desired sound masking spectrum (also called a curve). In fact, we set the bar for volume consistency at ±0.5 dBA, ensuring that LogiSon® sound masking is both effective and unobtrusive. You can try to mask conversations and noise in your environment with any sound masking system. But how well you can do it depends on the size of the system’s zones and the degree to which you can control each one. Without exaggeration, everything rides on your adjustment zones—speech privacy, noise control and comfort. Less control simply means less satisfaction. The LogiSon Acoustic Network provides the smallest zones (1 to 3 loudspeakers) and the finest adjustments within each one—100 volume steps in 0.5 dBA increments and 1/3-octave frequency control over the complete sound masking spectrum. That means that your sound masking can be tuned to local conditions, ensuring that it’s comfortable and effective across your entire space. Why are small zones important? 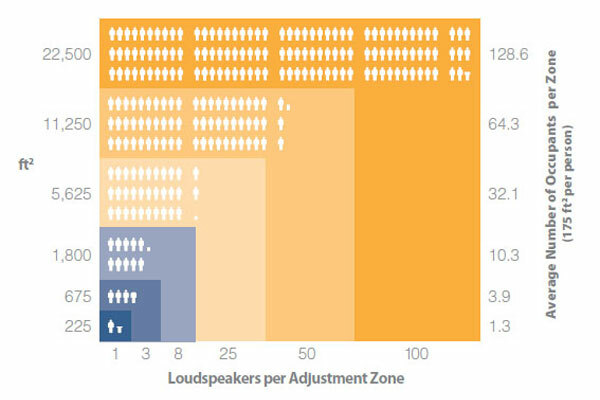 When a sound masking system’s adjustment zones are larger, the masking sound will fluctuate across your space as it interacts with elements of your workplace design—even if loudspeakers are set to the same volume and frequency. And if you can’t make precise changes in specific areas, you’ll have to settle for setting each zone to a level that’s merely best on average. Some large-zoned systems try to address this problem by providing audio transformers at each loudspeaker, but these can only offer coarse volume adjustments—and no control over frequency. No matter how you install the loudspeakers or what you try to do, large zones will create this effect. Others direct their loudspeakers downward in a mistaken attempt to compensate for design factors influencing the sound. In reality, this approach simply doesn’t provide the control you need to get the best result. This graph shows the number of people who would occupy zones of various sizes. As you can see on the graph, the larger the zone, the greater the number of occupants who are affected by changes to the system’s settings. If you’re forced to increase the volume to improve the system’s effectiveness for some occupants in one area, it will be too loud for others. And if you need to lower it, you’ll sacrifice speech privacy and noise control. This pattern will repeat at unpredictable points across your space. You can usually expect a 10% reduction in performance for each decibel below the target masking volume. So why do some systems allow as much as 4 to 6 dB variation? Don’t risk your sound masking system’s performance or sacrifice your occupants’ comfort. Choose small zones and the LogiSon Acoustic Network.